The Rhomboids are two muscles - Rhomboid Major & Rhomboid Minor. 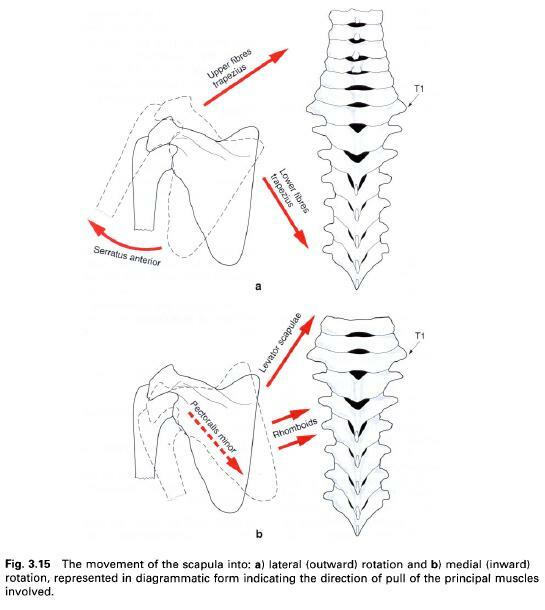 The two rhomboids lie deep to trapezius to form parallel bands that pass inferolaterally from the vertebrae to the medial border of the scapula. 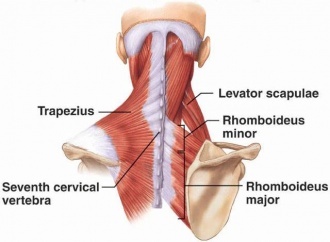 Rhomboid Major is thin and flat and twice as wide as the thicker Rhomboid Minor which lies superior to it. Usually there is a small space between both rhomboid muscles, however in some cases one may find one single blended muscle instead. Occasionally with additional contribution from the C4 Nerve Root. 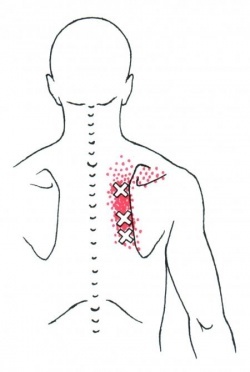 The referral pattern of the Rhomboids is not as widely distributed but local to the muscles. The pain generally extends from the edge of the shoulder blades to the spine. 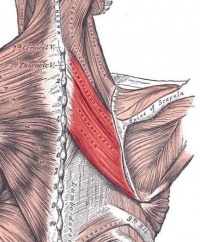 Since the Rhomboids on both sides are almost always affected, this is a primary source of mid back tightness or aching between the shoulder blades. Palpated together. Covered by trapezius so need to relax trapezius by placing hand in small of back. Palpate along vertebral border by placing fingers under it. Have patient lift hand off back (with resistance if needed) and the rhomboids push fingers out.